Nick Antosca is an American author of literary fiction. He is the author of four books: Fires (2006), Midnight Picnic (2009), The Obese (2012), and The Girlfriend Game (2013). Antosca was born in New Orleans, Louisiana and currently lives in Los Angeles, California. He is a 2005 graduate of Yale University. Monkeybicycle: The Hangman’s Ritual is an intense and brutal look at love and the lengths we’ll go to keep our loved ones safe. With echoes of Old Boy and corporate fascism, what influenced the writing of this? Nick Antosca: I was depressed and felt psychologically isolated when I wrote it. It’s an expression of that. And I had wanted to write something about an executioner. I still might write something else about an executioner, in fact, because this sort of morphed into something else. Also, I’ve always loved Oldboy and I always wondered what was going through the heads of those guards in that prison and how they ended up there. Mb: Much of this book has to do with the loss of control and agency. Talk about the importance of choice and what it means to lose it? NA: It means the loss of everything, I guess. A sense of futility destroys your sense of self-worth. Really in any area of your life. When you lose a sense of agency, the appeal of suicide increases. Mb: Ritual is an act of creation, an act of salvation. How does the act of creation save us, or make us more human? NA: Rituals help people be less depressed. Basic everyday rituals like getting dressed at a certain time, doing twenty push-ups, brushing your teeth, taking a shower—simple things like that give you a sense of purpose. I don’t know if those kinds of rituals are acts of creation. They’re acts of maintenance, and they imply that your existence has a purpose—you have to be maintaining yourself for something. But in the context of the book, where the ritual is secret and specific to an individual, it’s more about ownership and defiance. Create something no one knows you have, and no one can take it away from you. Also it’s proof (to yourself) that no matter how hard they try, they can’t control you completely. It’s like something I read that certain Polish political prisoners did. Repeat a mantra or something like that. I’ve tried to find the article since I wrote Hangman’s Ritual, but I haven’t been able to find it. Rudolph Watkins was right. The Ritual is the key. If he survives, it will be the Ritual that kept him alive. You have to have something they can’t take away. Mb: You’ve written for film and television as well as novels and novellas. How does the medium you’re writing for affect the piece? Which do you prefer to write for? NA: If I’m writing prose fiction, I have more room to explore the inner life of a character. I try not to write fiction that could work just as well as a screenplay. That’s one reason I like to write in the first person. And The Hangman’s Ritual, obviously, would be tough to make as a film because much of it takes place in one room, in one character’s head. I don’t have a preference in terms of what medium I write for. I love fiction, TV, and movies. But TV writing pays more, and I need to make a living, so that takes the majority of my time these days. 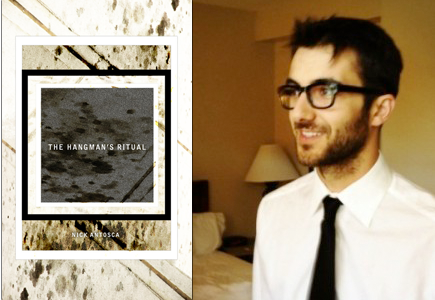 Mb: The Hangman Ritual is your second novel of the year. What’s next for you and what are you working on now? NA: In fairness, The Hangman’s Ritual is a novella and the other book is a collection of stories, and neither of them were written this year. I’m not as productive as it seems at first glance. Right now I am working on a TV show called Believe that should be on NBC in March 2014. I’m also writing some fiction and working on some scripts with my screenwriting partner. Read more from / about Nick Antosca here. Buy a copy of The Hangman’s Ritual here.